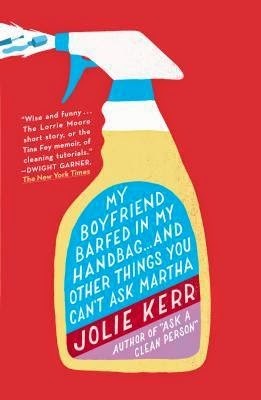 Review: My Boyfriend Barfed in My Handbag, and Other Things You Can’t Ask Martha – What Book is That? Thankfully, Jolie Kerr has both staggering cleaning knowledge and a sense of humor. With signature sass and straight talk, Jolie takes on questions ranging from the basic—how do I use a mop? —to the esoteric—what should I do when bottles of homebrewed ginger beer explode in my kitchen. My Boyfriend Barfed in My Handbag proves that even the most nightmarish cleaning conundrums can be solved with a smile, the right supplies, and a little music. I don’t honestly remember where I first heard about this book but I’m glad I read it because it was super fun! I know, I know, the phrase “super fun” isn’t one you’re likely to associate with a book about cleaning and stain removal and all that jazz, but it’s totally the truth! The book tackles a variety of topics, from which cleaner is best for which surface, to stain removal (and I do mean stain removal- if it comes out of an organism, Jolie Kerr talks about how to get it off your stuff,) to laundry strategies for various fabrics, to getting rid of odors, to sanitizing surfaces, the list goes on. There are plenty of charts that organize the information for easy reference later, and plenty of letters to the author that lay out the kind of nasty, nasty messes that people need to clean up. A big part of that is the writing is effervescent and fun, and the tone is lighthearted throughout- people are nasty, it’s true, and the important part is to get the mess taken care of, isn’t it? Hi everyone! This blog is updated occasionally as the need to talk about awesome books strikes me. Check back to see if there’s anything new- or use the subscription options and never miss a post! I’m a special ed teacher during the day and a reader basically all the rest of the time. I’ve been told I have a quirky sense of humor. You’ve been warned.